Our horse-chestnut trees are facing a range of different threats. 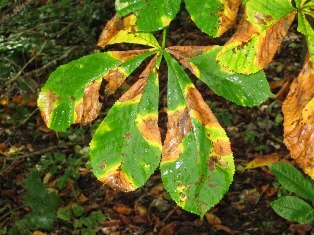 The most striking is the damage caused by the horse-chestnut leaf-miner. Damage caused by the leaf-mining moth. What is it? A tiny little moth (it's scientiifc name is Cameraria ohridella), which has caterpillars that mine the inside of the horse-chestnut leaves. What damage does it do? Each caterpillar living inside the leaf produces a blotch about the size of a ballpoint pen lid. Blotches are initially pale, but turn brown. Get enough leaf mines and the tree can turn so brown that it looks like autumn has come early. How serious is it? It does not kill the tree. There is mixed evidence of the effect it has on the trees, but it does reduce the photosynthetic capacity of the tree - meaning the tree produces less food for itself. How long has it been attacking our conker trees? It has only been in Britain since 2002. It spread from London at a rate of about 30km per year and is now found across most of England and Wales - but not any further than Newcastle. What is it? Many different organisms cause symptoms called bleeding canker in trees. The current disease in horse-chestnuts is caused by a bacterium called Pseudomonas syringae pv aesculi. What damage does it do? To put it simply it clogs up the tree's veins. 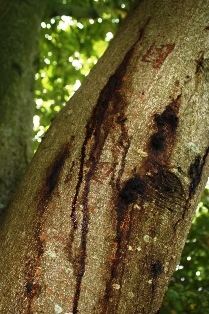 The most obvious symptom is weeping wounds from the trunk of the tree and rust-coloured stains on the bark. How long has it been attacking our conker trees? 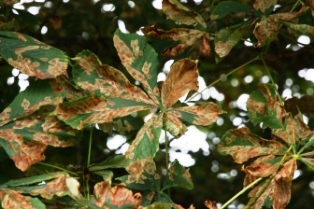 Although different types of bleeding canker have been attacking horse-chestnuts for a long time, this current epidemic has been spreading since about 2000 (which is about the time the leaf-miner arrived).